Bombs tore through the main airport for the Belgian capital and a subway station in central Brussels on Tuesday, a day after authorities said a suspect in the Nov. 13, 2015 Paris terror attacks -- possibly the bomb-maker -- was likely loose in the city. The Islamic State of Iraq and Syria (ISIS) claimed responsibility for the attacks, saying its extremists opened fire in the airport and "several of them" detonated suicide belts. The posting in the group's Amaq news agency said another suicide attacker detonated in the metro. It claimed the attack was in response to Belgium's support of the international coalition arrayed against it. At least 36 people were killed in what Belgian federal prosecutor Frederic Van Leeuw said were "terrorist attacks" in the city, which has been on high alert since the Paris carnage last year. A U.S. law enforcement source told CBS News that there were two known U.S. citizens injured in the attacks, and the State Department was still trying to confirm the whereabouts of an employee who remained missing. Belgium's public broadcaster RTBF said at least one suicide bomber was behind the two explosions at the airport. A U.S. official told CBS News that at least 16 people were killed and dozens injured in the blasts in the departure hall at Brussels Airport. Some witnesses told Sky News the blasts struck near the American Airlines desk in the departures hall. Belgian media reported that gunshots were heard, and shouting in Arabic, before the explosions. Two sources confirmed to CBS News that a Kalashnikov assault rifle was found in the terminal, and there were reports that an unexploded explosive device was also found in the airport. About an hour after the explosions at the airport, there was a blast at the Maelbeek Metro station in central Brussels, very near the U.S. Embassy and European Union headquarters. The Metro system was shut down. Emergency workers could be seen treating several injured people outside the metro station at Maelbeek. The mayor of Brussels said at least 20 people died in the Maelbeek Metro attack. Dozens more were left wounded. "The Metro was leaving Maelbeek station for Schuman when there was a really loud explosion," Alexandre Brans, 32, told the AP as he wiped blood off his face. "It was panic everywhere. There were a lot of people in the Metro." All flights in and out of Brussels Airport were cancelled, and all public transport in the Belgian capital was also shutdown. Eurostar trains in and out of Brussels from the rest of Europe were also cancelled Tuesday. Belgian Interior Minister Jan Jambon raised the nation's terror alert to its maximum level in the wake of explosions at the airport, indicating authorities believed a terrorist attack to be imminent. "What we feared has happened," Belgian Prime Minister Charles Michel said, urging his nation to "be calm and show solidarity." Brussels attacks "accelerated" by Paris suspect's arrest? It was atrocious. The ceilings collapsed," traveller Zach Mouzoun, who flew in from Geneva just minutes before the first explosion at the airport, told The Associated Press. "There was blood everywhere, injured people, bags everywhere... We were walking in the debris. It was a war scene." Police arrested one of the prime suspects in the Paris attacks, Salah Abdeslam, on Friday in the now-notorious Brussels neighborhood of Molenbeek. On Monday, officials said they were still searching another man, identified as Najim Laachraoui -- who may have been group's bomb-maker. CBS News correspondent Charlie D'Agata reported that, according to Belgian authorities, Laachraoui's DNA was found on the explosives used in the gun and suicide attacks in Paris. The carnage in Paris is believed to have been planned largely in Brussels, where a handful of the attackers lived or had links. That attack was blamed on ISIS, but the attackers were "home-grown" militants, from Europe. His whereabouts are unknown, and prosecutors admitted Monday they weren't close to solving the puzzle. CBS News correspondent Elizabeth Palmer notes that in 2015 alone, Belgium convicted 33 people of joining or supporting ISIS -- some of them in absentia as they were believed to be in Syria. That, said Palmer, may just have been the tip of the iceberg. Belgium's prime minister said there was no information immediately available to suggest a link between Tuesday's attacks and the arrest on Friday of Abdeslam. However, a U.S. official told CBS News that the attacks have all the hallmarks of ISIS, and the fact that it could happen just shows how "relentless" the terrorists are in attempting to pull off attacks. 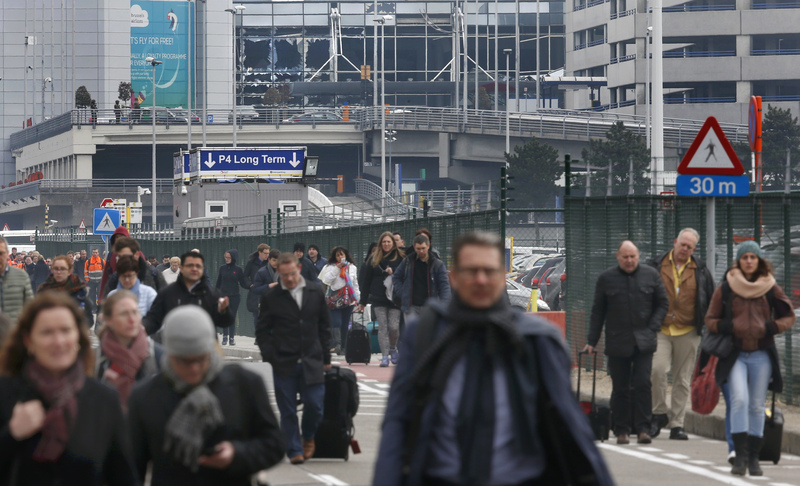 The official said the attacks in Brussels exposed weaknesses in airport security as well as on subway systems worldwide. Video and photos from Brussels Airport, which is located in Zaventem, a suburb just northeast of the capital, showed windows of the main terminal blown out with smoke rising from the shattered panes. Inside, CBS News partner network Sky News showed live images of passengers being herded by airport staff toward exits away from the scene of the explosions. The mood seemed tense but orderly and mostly calm. Sky's Alex Rossi, who was in the terminal at the time of the blasts at about 8 a.m local time (3 a.m. Eastern), said they caused the building to shake. Video from the main departures hall, taken on cell phone by a passenger, showed dozens of ceiling tiles and other debris on the floor. Passengers were being told by airport officials to leave their hand luggage on the floor and to continue toward airport exits. Outside, passengers gathered on the tarmac and were guided onto buses to be transported to a crisis center. In a statement, American Airlines said it was aware of the incident and that "all of our employees and contractors are accounted for with no reported injuries." The attacks in Brussels quickly sent shockwaves around Europe, and the world, with French and British authorities stepping up security around public transport hubs. "Terrorists struck Brussels but it was Europe that was targeted," said French President Francois Hollande. Across the Atlanic, a U.S. law enforcement source told CBS News there was no new information or intelligence to suggest there was a credible threat to U.S. homeland, but authorities were exercising an abundance of caution. In Washington D.C., a Metro spokesman told CBS News correspondent Kris Van Cleave that while there were no specific or credible threats against the network, it was standard procedure to increase security and visibility of police following an attack like Brussels, so commuters in the U.S. capital should expect to see a higher level of visibility from police around the transit system. Police in New York City were also ramping-up visibility and patrols.